After a failed marriage , Sneha ,a single working mom ,has no time or inclination for love. She resists every match-making attempt made by the overzealous Nandini, married to industrialist Aditya. But then her past merges with her present in the form of the gorgeous and rich Nikhil, who brings along Gayatri to break-up her ex-fiance, Aditya’s marriage. Sneha seeks Nikhil’s help to salvage the situation. But how does she even talk to the man who clearly loathes her ? As Nikhil and Sneha try to grapple with their egos and electrifying sexual tension and chemistry, love blossoms. 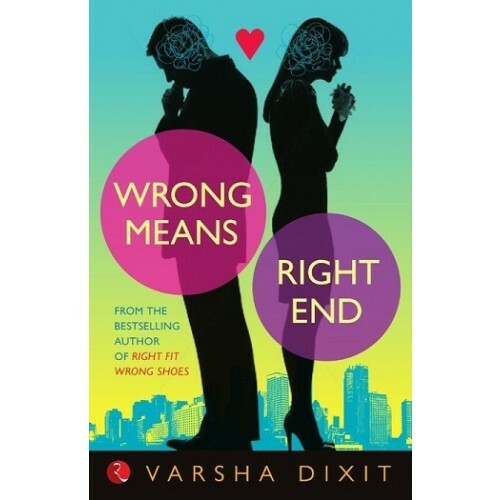 Wrong Means Right End, is a compelling saga of unspoken feelings, thwarted ambitions, strained friendships and reluctant new beginnings. Just as Nandini Sharma and Aditya Sarin begin a new journey in matrimony, Sneha Gupta begins her own as a single mom. In the ongoing mayhem enters Nikhil Chandel, an indifferent cold recluse with hidden agendas that encompass not only the two friends but all that they hold precious. Sneha's and Nandini’s devoted friendship rides perilous water as conspiracies are hatched and misunderstandings flourish. Will the two friends emerge stronger because of the challenges or drift apart? Aditya and Nandini will be forced to question if love is enough to make a marriage work. The writer's focus is on Sneha and Nandini , as they leave "Cawnpore" for a better glamorous life in Bombay. The story basically focuses on Sneha's melancholic life and why she can't move on and find love again. The author succeeds in portraying the strong bond between the BFFs, for Nandini is always involved in hooking up Sneha, and how the latter can give up everything to save her best friend's wedding from the evil. The initial chapters seemed a little slow to catch up on but the interest develops as the story progresses. Sneha's is a "practically romantic" love story, which would keep you wanting for more. The relationships of the main characters all impresses as we can relate to it on a daily basis and the high end upper class Bombay metropolitan culture that we all aspire for is described here beautifully. The characters be it the amiable housemaid Amla , the househelp at Nikhil’s house who tries to speak English but fails miserably is adorable too. And along with that, the covering up of the cuss words by both the female protagonists by using funny nonsense words is endearing. As we get deeper into the book we finds mostly all of the characters have their own deeper and inner secrets and demons which they have to vanquish with the help of each other. The entry of characters at the middle of the book such as the jealous ex flame of Aditya - Gayatri ,that runs the pace of the book at a much faster rate and the story picks up. After that while on a romantic date Nikhil comes out with his ugly past involving his ex Alisha Sarkar. There we cannot help but feel pity and sympathies with his character. The main theme and gist of the book is for the main characters to come in terms with their identity, relationships and love and mostly accept the person that they are and along they process find which relationships are true and which are fake. The book makes quite an impression. Readers will fall in love with Sneha and Nandhini who are two best friends who stuck with each other through heartbreak and joy through the novel and lives their life in Mumbai. It is a delightful story where you journey with these two women’s story. It is very well written. Varsha’s sentence composition is so interesting. The book has something new and unexpected in and around every corner. Aditya and Nandini will be forced to question if ‘love’ is enough to make a marriage work. Will Sneha become a mere pawn in Nikhil’s plan or will she change the game altogether? And can scarred hearts and damaged goods be lucky enough to get a second chance? It is an exuberant story about love and friendship and is filled with surprises and a wicked twist at every turn. To find the answers to all these question and more, do read Wrong Means Right End. But is it still right when a couple met in an online dating site? A have a friend who met his match at fastcupid and they seem to turn out great. Sometimes it's just right timing and proper attitude at first click.